For the most part I’ve been trying to stay out of the thrift stores because I am busy purging and donating stuff to make way for auction and yard sale season AND I find the prices this time of the year a bit too steep. It is also hit and miss at both thrift stores and auctions as everyone is on their own schedule when it comes time to purge. However, over the last few days the temperature has been steadily climbing and I feel that I am starting to feel that Spring Fever in my thrift hunting/auction going bones. It is also very hard to resist doing a once around the thrift store when you are there anyway dropping off donations – so I admit I give in and take a look to see if there’s anything that catches my eye. I did manage to find a few thrifty items, some are for me and some I will sell. I didn’t find all of this on the same day…ahem, I made a few trips to the donation centre. I simply couldn’t resist this little pair of S&P shakers (marked 2112 Japan). 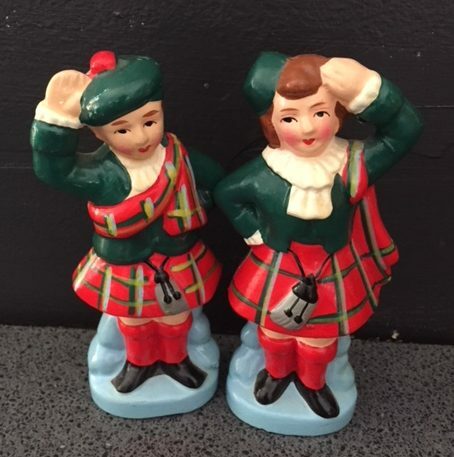 I can’t narrow down what I love about them more, the vibrant colors or the kilts, I just know they made me smile so, of course, they came home with me. 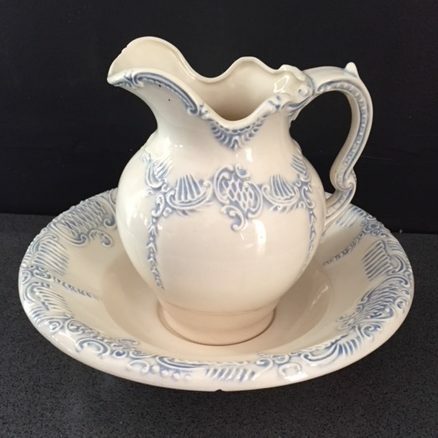 Whenever I see a ceramic pitcher and bowl, even though this one had a small flea bite, if the price is right, I don’t leave it behind, as they sell quickly. 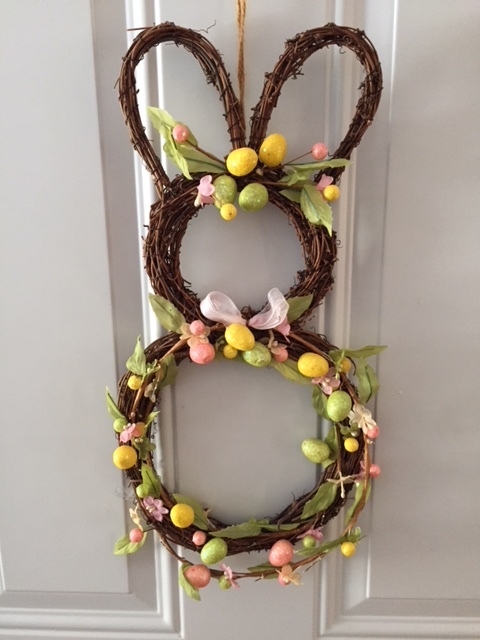 I could not resist a little bit of Easter and took this home ($2.50) and as you see in the picture it is already hanging on my door. How many of you see something and immediately put it in the cart and then have that dilemma with yourself, do I keep or do I sell? That is how this next piece is for me. 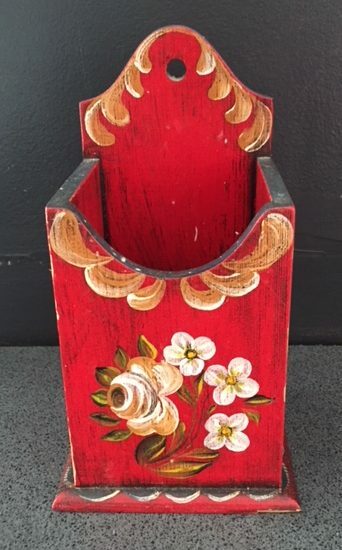 It is a candle box (back in the day it would hang on the wall and hold tapered candles for finger lamps) this one has been painted and I love the colors – it has so many uses….hmmm what to do. That’s it for now, I really did donate more than I bought – honest. Have you been purging and/or buying lately? Do you have any projects lined up for Spring that might include Vintage and/or thrifted items? Would love to hear from you. Purging and thrifting…they are both Wandaful things. 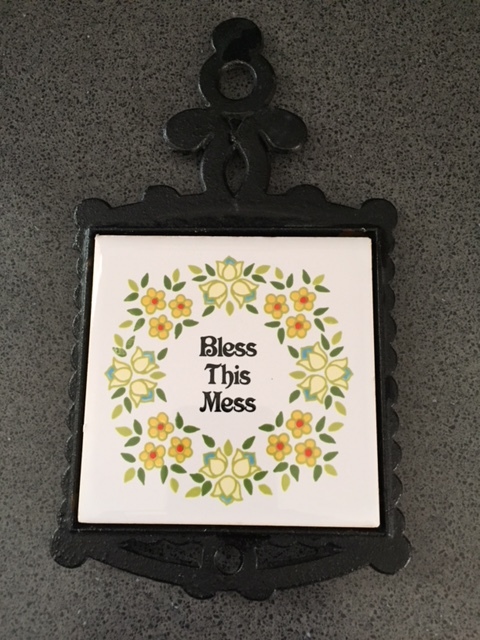 This entry was posted in Decorate, DIY, vintage and tagged auction, box, candle, cast iron, donate, easter, old, purge, salt and pepper, thrift, tile, trivet, vintage. Bookmark the permalink. Purging but not much buying. Getting rid of a lot of children’s books. No kids in our life for the foreseeable future. I always enjoy purging and am surprised what I can gather from season to season. I am sure there are some lucky children who will enjoy the books you are purging. Some neat items. Wreath is sweet. I am purging at the moment. Bag to goodwill yesterday.